The new Callaway PM Grind 19 wedge. If you fancy yourself a short game wizard like Phil Mickelson, or just want to become one, the new Callaway PM Grind 19 wedges ($159.99 each) are right up your alley. Co-designed by Phil and famed wedge master Roger Cleveland, the new short game tools are based on the original model complete with a very high toe and large clubhead with grooves extending the entire width of the face. The new model is modified to help players hit Phil’s three most valued shots – the knockdown, the hit and check, and the flop. 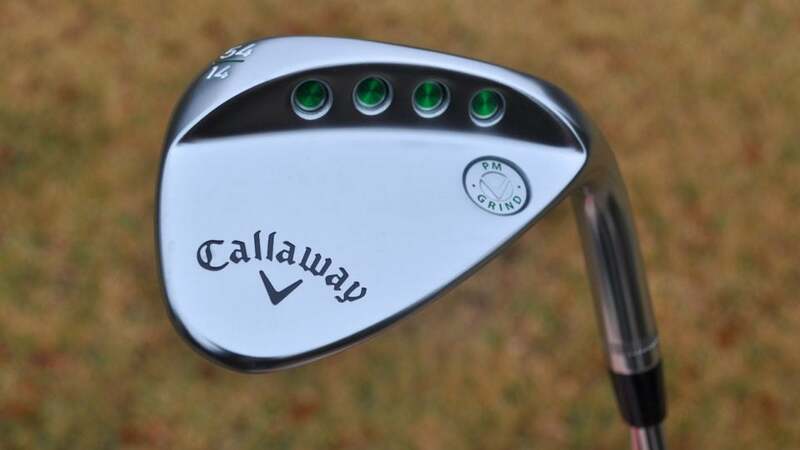 A look at the new Callaway PM Grind 19 wedge at address. The first modification is more offset and an even higher toe, the combination of which allows players to play the ball farther back in the stance and more easily drive the ball into the target on a low trajectory. Next, Phil suggested placing the micro grooves (machined ridges between the main grooves) on a 20-degree angle, so they’re nearly perpendicular to the target line when the face is opened on flop shots. The result is up to 12% more spin than the previous model. A view of the face of the new Callaway PM Grind 19 wedge. Finally, a C-Grind sole with relief in the heel and toe increases overall versatility so the PM Grind 19 wedges can perform from just about any lie, even if you drive it as wild as Phil does on occasion. Other features of the new PM Grind 19 wedges include KBS Hi-Rev 2.0 steel wedge shafts, Lamkin UTX grips, and a choice of platinum chrome or Tour gray finish. Lofts available include 54, 56, 58, 60, and 64-degrees. The hosel on the new Callaway PM Grind 19 wedge. The new PM Grind 19 wedges will be at retail on Februrary 15th.